"When Krsna walked on the bank of the Yamuna, He was seen nicely decorated with tilaka on His head. He was garlanded with different kinds of forest flowers, and His body was smeared by the pulp of sandalwood and tulasi leaves. The bumblebees became mad after the treasure and sweet nectar of the atmosphere. Being pleased by the humming sound of the bees, Krsna would play His flute, and together the sounds became so sweet to hear that the aquatics, the cranes, swans and ducks and other birds were charmed. Instead of swimming or flying, they became stunned. 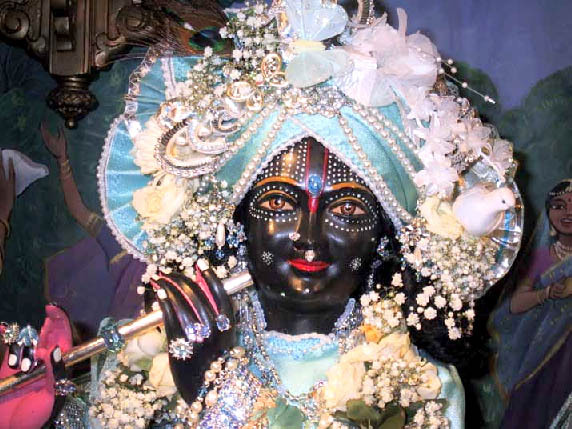 They closed their eyes and entered a trance of meditation in worship of Krsna."